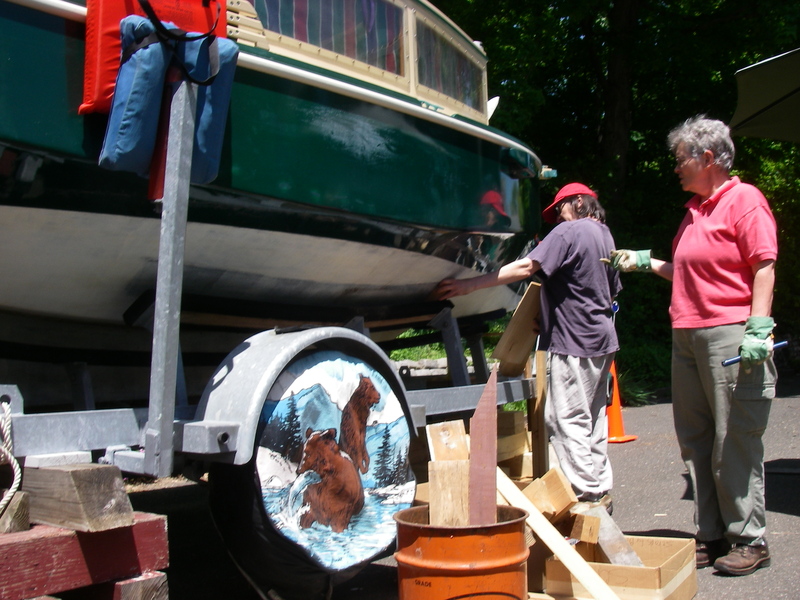 The goal: raising the boat above the trailer enough to be able to work on the bottom of the keel, as well as to put more non-toxic antifouling paint where the trailer bunks prevented doing that last year. Bottom line, it worked! Though there was a small amount of drama along the way, providing opportunities for learning. The boat is now up on blocks on top of the already blocked trailer, accessible for the needed work. As none of the three of us (myself, Theo, and Suzanne) have ever done this before, I think we did fairly well. Extensive cribbing for the single jack forward of the keel, and two Brownell motorboat stands (nope, not receiving anything) at the stern, provided both lifting and stability. Going up went very smoothly. Alternating quarter turns on the stern jacks kept everything balanced, and the hydraulic house jack forward, seated against a cradle made to straddle the skeg forward of the keel, worked well. 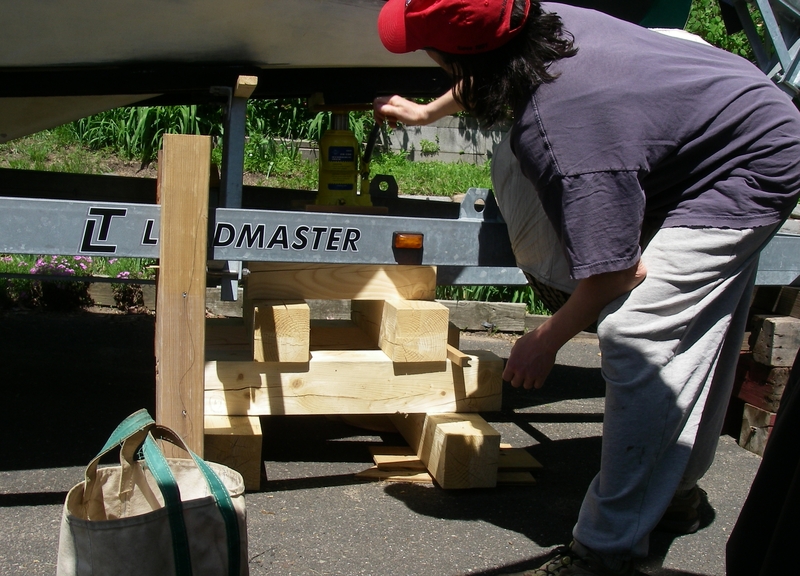 The learning opportunities came with the process of the slight lowering of the boat so that it could settle down onto the 4 x 4 blocks that had been placed on the trailer keel support, under the keel. Letting the forward jack down, we discovered slightly after the fact, had just barely lifted the stern, so that it was no longer firmly supported by both stern jacks. Not good, as one of their jobs is providing lateral stability! During very gradual and slight lowering of the bow jack, to let the boat settle onto the blocks, there was a very small shift of the hull, whereupon we stopped to investigate. Attempting to adjust the stands at the stern, the starboard one was jammed and not responding to the giant “wingnut,” which was completely loose. That was alarming… It made me wish for a third stand, to brace that part of the hull and release the pressure from the one that was jammed. As it was, after additional blocking along the bunk boards, we tried a gentle lean to push the hull to the other side, which it did and then settled back again to starboard. But the brief release of tension was enough to free up the jack stand threads. 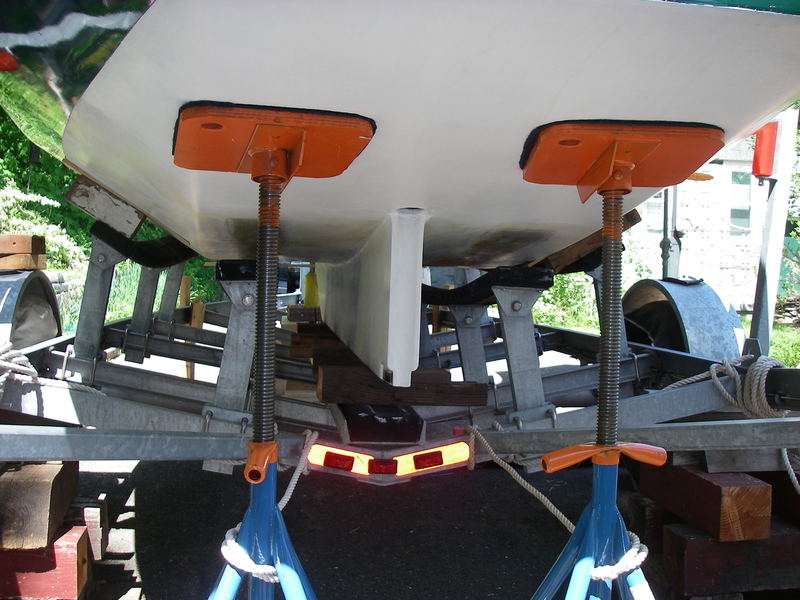 After that it was easy to put tension on both stands, and to adjust the leveling of the boat. It wasn’t off-level enough to see, but putting a carpenter’s level across the stern showed what was happening. Lessons learned: First off, I think that the jack stands are overextended. They are still within their working range, but if we were to block up their bases even just a few inches it would be more secure, and perhaps would also help to prevent jamming. During any lowering action, continuously monitor stern jack stands for constant load, especially while adjusting forward jack. Focus on maintaining weight on stern stands at all times, and be alert to see-saw effect of raising or lowering forward jack. 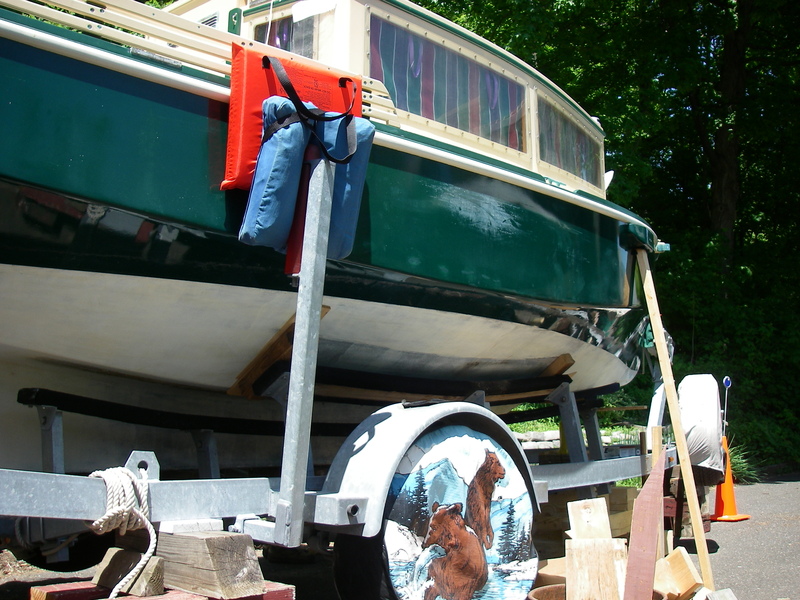 The boat cushions that show in the photo, between the boat and the guide-on post, should be in place during settling of boat onto blocks – we figured that out after the fact. During raising, we had been keeping temporary blocks at the bunk boards, but felt that these would create problems during lowering, as we wanted all the weight to bear on the keel, and not to trap blocks at the bunks. The guide-on posts are great in this situation – if we didn’t have them, I’d want to think up another alternative for providing redundant side to side stability. Theo gets the prize for quick thinking and action when the boat wanted to tip – but I would rather see a process that feels entirely, solidly under control throughout. So we learn! Meantime, now the boat is up, and this phase of the project is underway. It’s a good thing – access to the underside of the keel is revealing both scrapes down to bare wood, and paint in need of help. It’ll be great to see it more in order!